You guys, I can't believe that I'm actually writing this post. We've been working on this project for what feels like since the day we moved into this house. As you can tell, the garage hasn't been our priority. We would work on it here and there but would never get it all the way finished. Since having our little one, we've been wanting a place that we could go to easily go to exercise. We weren't willing to give up room inside the house for our little home gym, so the garage was the only space available. We also wanted to make sure that we would still be able to park both our cars in the garage - with a two car garage, this was no easy feat. So how were we able to do it? 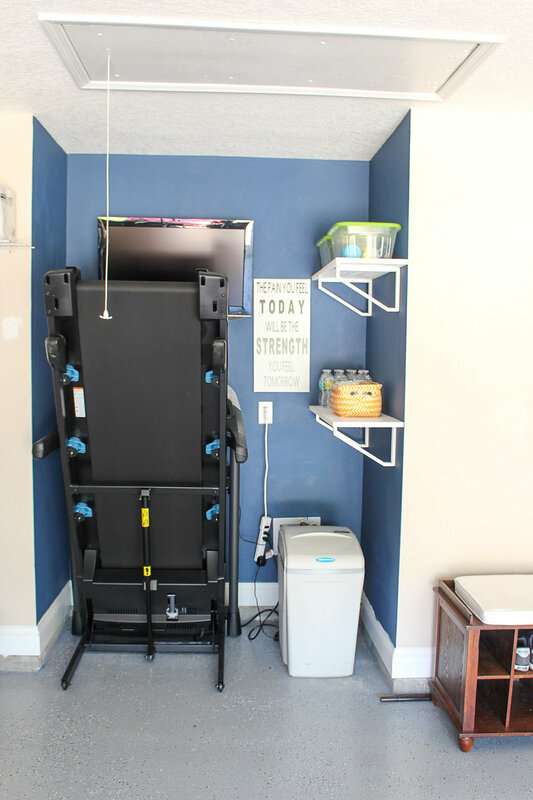 By capitalizing on a small recessed space that was meant to house a water softener, not only were we able to fit a workout area but also fit a water softener too! I "decorate" my garage to make it feel like just another room in our home. When we first started planning out this space, we struggled on the layout and how we wanted the space to function. Not only does it have to house our cars but also our garden tools, bikes, treadmill, kid toys, etc. So after trying out many different combinations that weren't completely working for us, I decided to "decorate" the garage in the same way that I would any other room in my home. I started by assigning sections and then making each section "pretty" just like I would do with a room in my home. 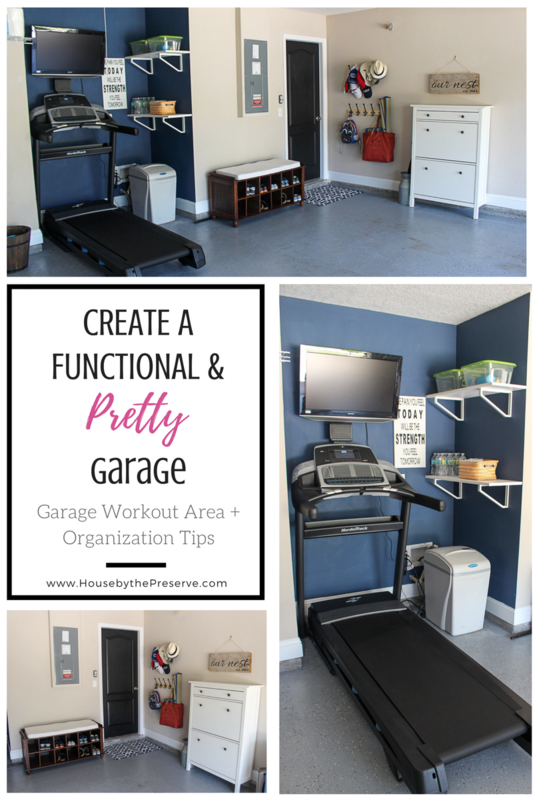 By decorating the garage, I was able to create a space that not only looks pretty but is also super functional. I started by assigning sections so that I could make sure I had a space for everything that needed to stay in the garage. By following this simple strategy, I was able to ensure that we have a spot for everything that needs to be stored here. 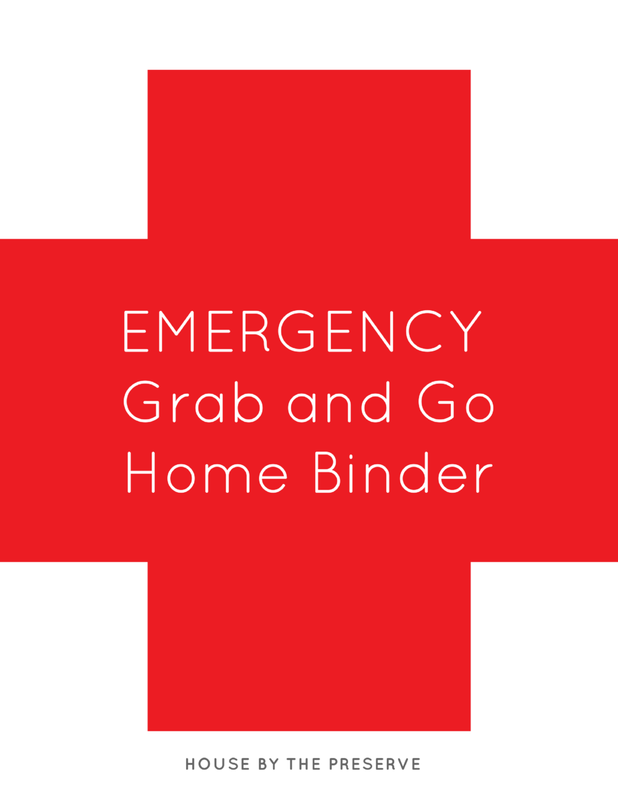 This strategy is also helpful for other members of your family to know where to put items back where they belong. That's a win in my book! With limited storage space, we have to get super creative with how we are using the wall space in our garage. By putting our bikes on the wall, it allows us to have the floor free of clutter while still giving us enough floor space to be able to park two cars. 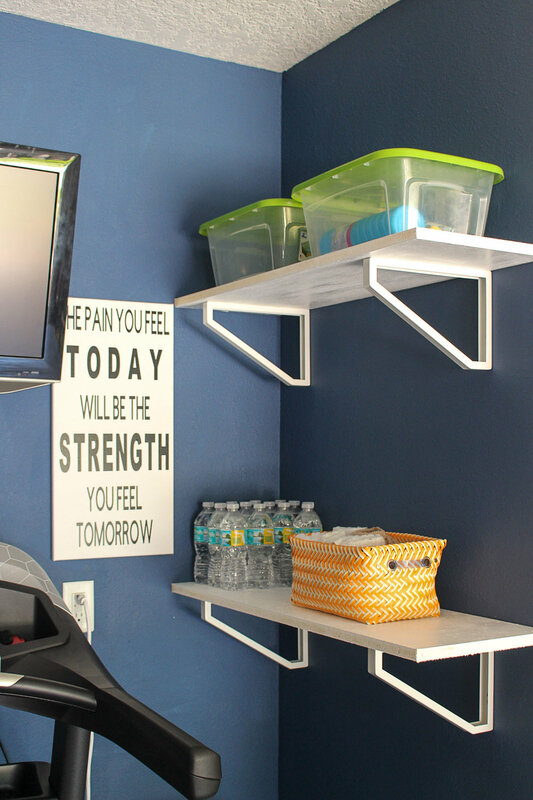 We also hung two shelves right next to the treadmill for additional storage and to keep water and towels nearby when working out. Also, right by the entrance, we have several wall hooks to keep all our hats, jackets, reusable grocery bags ready to use whenever we should need it. 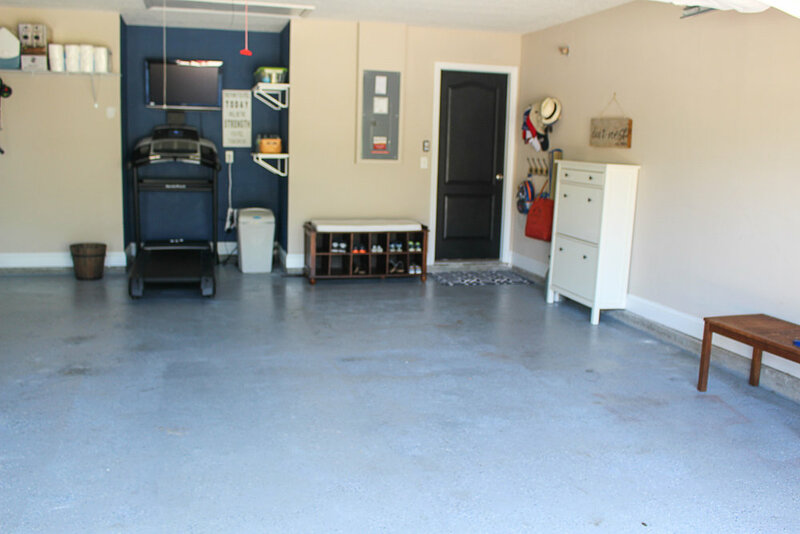 By creating a landing space in our garage, it has reduced the amount of "stuff" that comes into the house. We set up an IKEA Hemnes shoe cabinet to keep our shoes organized and out of the way. This has made it easy for us to make our house stays clean by taking off our shoes before going into the house. I also set up a sitting bench with even more shoe storage down below. Added a pretty little sign above the shoe cabinet that I DIY'd last year and the space is done! 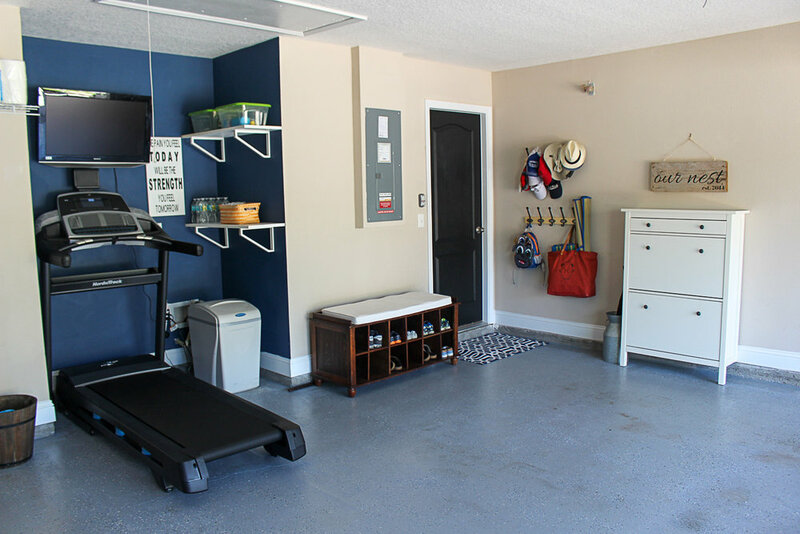 How do you keep your garage organized? Leave me a comment below! Now head on over to your inbox and confirm your email address to get your freebies!